Mix the radishes with the tomatoes. Whisk the oil and vinegar together and season well. Pour over the tomatoes and radishes and leave to macerate for 15 minutes in a warm spot. Dab the squid with kitchen paper to remove any water (only dry squid will caramelise well on cooking). Heat a large, non-stick pan over a high heat and add the olive oil for cooking. When the pan is near smoking, add the squid and season well. Cook for 2–3 minutes on one side or until golden brown, then turn over and cook for a further 1–2 minutes, until coloured on both sides. 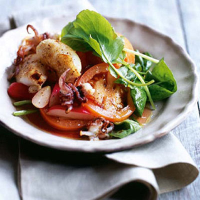 Quickly move the squid from the pan onto a plate lined with kitchen paper to drain; squeeze over some lemon juice. Season the tomato mixture and stir in the sorrel leaves. Divide between small plates, reserving some of the dressing. Place the squid on top of the salad, followed by some of the radish leaves. Spoon over any extra dressing.